This is the first YA novel I’ve read in a while, since I’ve been so busy reading for class and for my undergrad journal, so I was really excited to get my hands on something that was purely for fun. I think fun is the best word to describe this book, if not also clever and real. 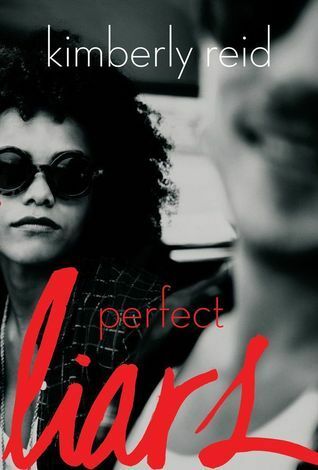 Perfect Liars is a novel that brings the troubles of everyday teenage life – including crushes, fear of becoming your parents, and living up to expectation – to the precipice of adult issues with morality, the criminal justice system, and finding your worth in society. Kimberly Reid brings us into the life of Drea, who has lived in luxury and privilege thanks to her parents booming, though not fully legitimate, antiques business. When Drea’s parents go missing, she and her brother, Damon, are forced grow up, and Drea joins allegiance with a group of kids no one in her community would ever match her with. This novel has a slow building beginning as we’re introduced to Drea, her family, her crazy estate, and her love interest, Xavier Kwon, a Korean American boy who’s working as a valet at her mother’s party. Xavier isn’t the only diverse character we encounter during this story, with a reveal on Drea and Damon’s biracial status (their mother is white, father black), as well as our residential Latina Gigi, who Drea catches trying to steal jewelry from her bedroom. Though the pace was lulled in the beginning, this book picks up steam and kept me engaged with a big heist in the first few chapters, which leads up to a series of other shady criminal activity, missing parents, and a shadowy figure that doesn’t get identified until the end. As a thriller and mystery fan, this book delivered in keeping me guessing while producing conundrum after conundrum to solve. The diversity in this book is also eloquently handled. Reid displays not only a racially diverse cast of teens, but economically diverse. Drea and Damon have known riches for most of their lives, but Xavier, Jason – Xavier’s best friend and hacking expert – and Gigi have had their struggles with poverty and low-income living. What makes these kids bond is their common link to criminal activity, and Reid uses this to show how people aren’t all that different from one another, whether the crime be blue or white-collar. What I also found interesting was Reid’s handling of stereotypes. She allows her characters to take on roles often associated with their race; Xavier is a black belt in Tae Kwon Do; we first meet Gigi as she works as a waitress and she’s repeatedly portrayed as the “Latin lover” trope. But she creates a space for them to be more than their labels, casting Xavier as an intelligent, strong, masculine force in this book where in most media, Asian men are often depicted as effeminate or as comedic sidekicks. He and Gigi are smart enough to be admitted to Drea’s private school, Woodruff, on scholarship, and are given a second chance through Justice Academy, a school for teens transitioning out of the juvenile detention system. Gigi herself is especially linguistically savvy and can speak 11 languages, including Farsi (like what?!) Reid is able to create kids who are ethnically specific, but have unique personalities that are often not depicted by mainstream media. One of my absolute favorite moments is when Drea is having a tutoring session with Tiana, a young black girl who attends Justice Academy and is petitioning to be skipped from the ninth grade to eleventh. Also she’s only 12. No biggie. She starts talking to Drea about this complicated math problem, and though her speech was originally “urban” colloquial dialect, when talking about math and science, she speaks with perfect grammar. When Drea asks her about it, Tiana says that she speaks comfortably around her family and grammatically around those who might judge her. She also doesn’t want people to say she’s trying to “talk white.” Tiana believes that grammar is only for the wealthy and fair skinned. And friends, Drea has the best response. I lost my mind. Not only because this line can be applied to so many aspects of the media and education, but because this is my life! Growing up as a black girl who didn’t talk “hood,” having my peers tell me I talk like a white girl was something that made me feel, well, not black enough. What’s more is that I look like Drea; light-skinned, golden brown hair, fair eyes, somewhat racially ambiguous. Or as Reid so eloquently points out, what many people would call “exotic” beauty. Living with a personality and a look that didn’t fit perfectly into the categories society often propagates made me confused about who I was, and who I was supposed to be. I absolutely LOVE the statement Reid has made about the ownership of language, education, and personal expression for people of all backgrounds. As I mentioned, this is definitely a YA novel, so it’s a lot more suited for young to late teens rather than my age group. I think that if I had this novel around as a teenage girl, I would have recommended it to all my friends (even though that’s what I’m doing anyway). If you’re looking for a book with a fun story line and diverse characters, I would definitely recommend Perfect Liars for your bookshelf! You can pick up Perfect Liars from Amazon, Barnes and Noble, Book-a-Million, and IndieBound. For more books by Kimberly Reid, check out her official site.